Okay, that might be a bit unfair, since McDonald’s does buy stock from sustainable fisheries. The company also recently agreed to ask potato suppliers to cut down on pesticide use. But nevertheless, MickeyD’s has a long way to go before its food production process ceases to gross us out. 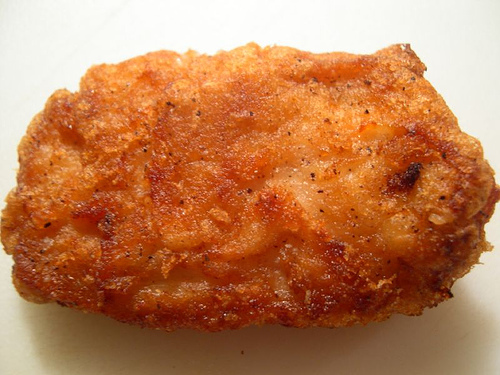 Case in point: this clip from Jamie Oliver’s Food Revolution showing the innards of an average chicken nugget. The kids in the video actually don’t seem to mind it in the end. Disclaimer: this isn’t an actual McDonald’s chicken nugget, but we imagine the chain’s production methods aren’t much prettier.